When I learned that the topic for November’s gallery would be Family Stories, I immediately knew what I wanted to do. 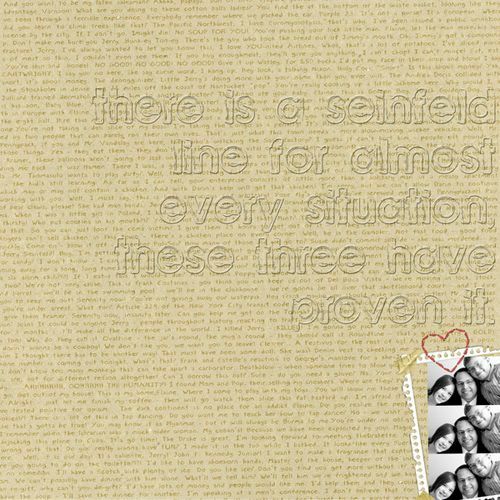 My husband and children have formed a special bond because of the television show Seinfeld. We’ll watch it as a family (only the appropriate episodes), and over the years, the kids and their dad have memorized hundreds of lines from the show. Our family will be talking at dinner, in a very nice, normal conversation, then all of the sudden I’ll have no idea what they are talking about. I am terrible at remembering how a line goes, I inevitably mix it up, but Kelly and the kids have the uncanny knack of remembering entire scenes. One person will start and they’ll just build off of each other. One day I said that every situation we could ever run across probably had some Seinfeld line connected to it. Sure enough, nearly every subject we threw out there, someone could think of a line. I knew it would be fun to make the background of the page be the lines themselves, but I did run into a few issues. First was finding the time to all gather together and do so, but they came through for me, and we now have a record of at least a few of the lines they are always quoting. Secondly, I didn’t want to have a title that competed with, or covered up the lines. I decided that acrylic letters would be the best solution. And lastly, I wanted a picture of them together, kind of like the covers of the Seinfeld DVDs, but I didn’t want the picture to be the center of attention. I ended up doing this digitally because I don’t have to cover up the text if I lower the opacity of the title. I also used the overlay-blending feature on the text so it would fade into the background, but still be readable. And making the photos small and moving them to the corner worked really well. I can let the text, title, and photos each shine, but not compete.